Can I just say that Models Own Disco Pants is probably the best name for a collection I’ve seen all year?! Unfortunately that’s about where the awesomeness of this release ends for me. Anyway, let’s look at the three colours I’ve been able to try out and start with the best one first. Studio 54 is easily the best of the bunch, a glowing hot pink shade with a reasonably nice, if slightly thick, formula and a forgiving application. Faring less well is Paradise Garage; I love the light emerald green colour but less impressed by the streaky, brushstroke-prone finish. Even further down the scale of pants (and I mean pants as in rubbish, not pants as in trousers) is Sound Factory – this sparkly sapphire blue could be stunning if it wasn’t for the low opacity. I’m wearing three coats in the photo above and there’s still some pretty obvious visible nail nail, and despite wearing a base coat for my swatches it’s stained my nails to all hell. Avoid. Is it just me, or are Models Own losing their touch a bit? Their recently collections seem to consist of a similar bunch of colours, just in different finishes each time, and this one certainly isn’t their best effort. 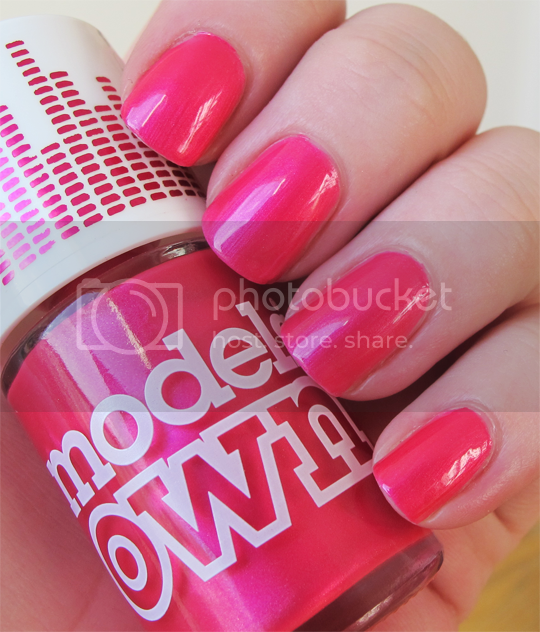 I miss the unusual, quirky Models Own that brought us the likes of the Mirrorball collection, which remains one of my favourite polish releases to date (I’ve just looked back, and holy moly my nails were long in 2012!). The brand are going to have to pull off something pretty freaking spectacular for their next collection to recapture my interest. What do you reckon? The Models Own Disco Pants collection will be available online at modelsownit.com from 17th October, from Models Own Bottleshops on the 18th and in Superdrug stores nationwide on the 22nd (no mention of Boots, I’m afraid), and will, as always, cost £4.99 each. Maybe you got a dud bottle of Sound Factory, my version was virtually opaque after one coat – two made it perfect… I never opted for the other two you’re showing here, I too am not a fan of brush stroke marks. I recommend Roxy from this collection tho, lovely and sparkly, definitely needs 2 coats tho.